A SHIP FULL OF INNOVATIONS AND WITH A TRULY UNIQUE 360-DEGREE PANORAMIC VIEW FROM THE HELM. Introducing the all new Bavaria E34, the latest addition in the Bavaria E Line. Bavaria says the E Line is an e-volution, instead of recreating features from other vessels, they have completely rewritten the book! ENOUGH SPACE FOR ABSOLUTELY EVERYTHING. BAVARIA YACHTS regularly comes up with new innovations. In the BAVARIA E34, it’s the fact that everything is centrally arranged: the lounge, the galley, the helmstand. Everything appears as one and blends together. The same goes for the outside: pass through the big door to the cockpit, which merges with the saloon inside. There’s lots of light thanks to numerous electrically operated roof hatches. TRUE DELIGHT – DAY AND NIGHT. A spacious owner’s cabin is situated in the bow of the BAVARIA E34. What’s special here is that one bed can become two, which you can slide apart. To ensure maximum privacy, each cabin has its own entrance as well as a separate bathroom and toilet – all fitted out with top-grade materials, as you would expect on a BAVARIA yacht. The first public appearance of the Bavaria E34 will take place in Australia in 2018. 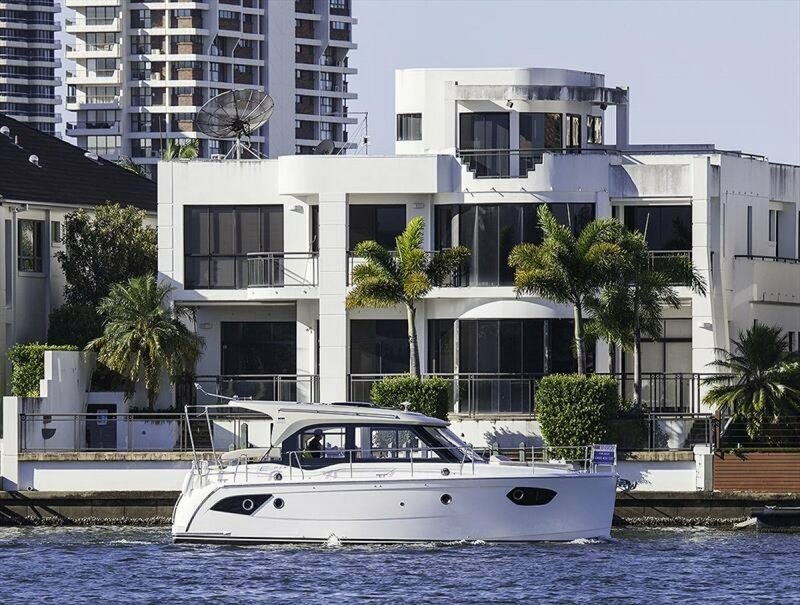 This vessel is available for immediate sale and has been built with all the extras. Including upgraded comfort package, upgraded smart package (chartplotter, Garmin GPS inc 8" multitouch display with Wifi, stern thruster, electric inc operating battery, exterior light package, FUSION Marine Audio Package, electric sliding sunroof, larger diesel tank. 1 x Module G for Charter.